Summertime is something that most of the modern world looks forward to. It represents freedom from school to children, sun-kissed faces, bonfires, and lots of time spent outside. Even though I am now an adult and do not get a summer vacation as I did when I was in school, there's something about the summer months that feels freeing, like somehow I do get a break. Summer means a lot of things really. It means chalk drawings on the pavement, kites flying, bubbles being blown out of wands, flowers blooming, gardens thriving, and lawns being mowed. It means pink lemonade, popsicles, watermelon, and s'mores. Summer means fun- even as an adult. 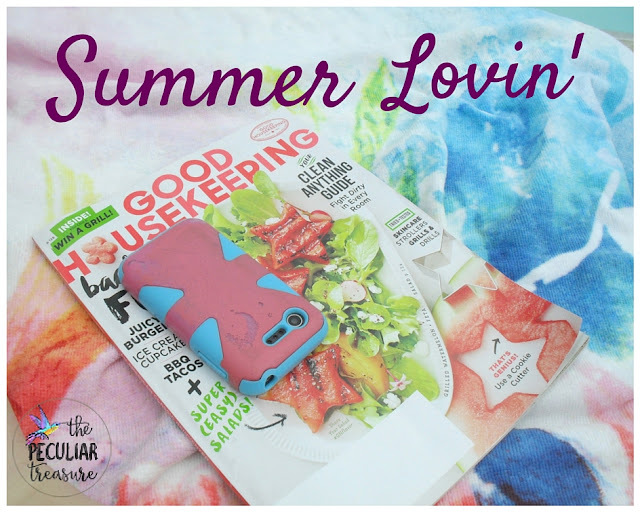 There are about a bazillion reasons that I love summer, but today, I'm sharing my five favorite reasons! When the weather gets warmer, all I want is that beachy breeze, the waves, and the ability to lay out on my towel and read a book or a magazine. It's a beautiful thing. And if you have an opportunity, I would urge you to go to the beach this Summer! My maiden name was "White". And growing up, it was a long standing joke that I was a "White girl". And boy is that ever true! My skin is so white during the winter. It almost glows. And when Summer rolls around, my body gets confused and doesn't really tan so much as it freckles. From far off, I may look like I have a decent(ish) tan, but we you get closer you will quickly see that my "tan" is actually just a large cluster of freckles. ha! I used to want to be a perfectly-tan, beach-babe, but I have learned to appreciate and even love my freckles as I've gotten older. I think they are cute, and they make me feel unique (in a good way). So to me, part of Summer time is getting all those freckles back, and I look forward to their arrival every year. I already talked about how much I love the ocean, but honestly, any type of water makes me happy- especially during the Summer. I love going to the pool, dipping my feet in a stream, paddle boarding on the lake, and even playing with the water hose when I'm watering flowers. Water, for whatever reason, makes me feel free and light-hearted. I have no idea why. But when the temperatures rise and I am better able to enjoy the water, it makes my heart so happy! Being from the beach, sunscreen was always a pretty prominent smell during Summer. All the extra-white tourists were trying to keep from turning extra-crispy, resulting in an over-abundance of sunscreen use. As a result, the smell now reminds me of long days at the beach swimming, picking up seashells, and going for walks with my family and friends. Good memories. Good smells. And I miss it so much that you can often find me using sunscreen as my lotion whether I'm going outside or not. I grew up with a family who loves ice cream- but really, who doesn't love ice cream? We ate it year-round, but once Summer arrived, it was constant. Mama would always make dinner, we'd eat together as a family, and then after dinner we would continue watching TV and each have a bowl of ice cream. Sometimes we would go sit out on our porch swing as the sun was setting. Summer is filled with amazing memories. Ones that I want to keep alive. I want to continue to enjoy the water, and take advantage of when it's warm enough to swim in the pool, go to the beach, and kick around in a stream. I want to embrace my freckles, the smell of sunscreen, and all the other joys that come along with the season. Believe it or not, Summer is not my favorite season, but it is one that I enjoy immensely, and I don't want that to ever change. What does Summer mean to you? Is it a happy time? What is your favorite part about the season? Summer means the beach, ice cream, sleeping in, and having fun with friends and family! I love this season! It's my last free summer before grad school/career so I'm soaking it up! Oh girl! You soak it up! I miss my free summers so badly! 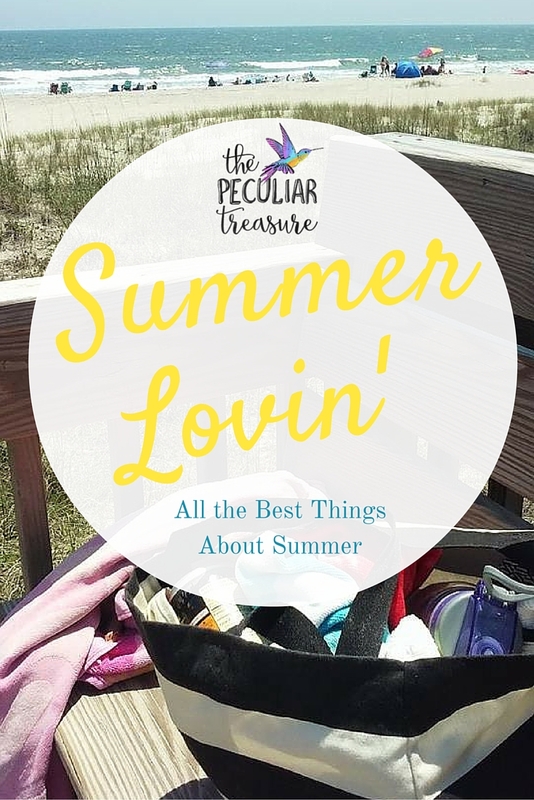 So many exciting things for summer! Yes! Definitely! Thanks for reading! Boy do I relate to freckles :) my grandpa would call them "angel kisses" but I still hated them as a kid. I've come to accept them because I had to lol. Great reasons to love summer, thanks for sharing! Haha! Yep! I love them now! I'm totally an ice cream year round type of gal! I love all things frozen! :-) I like having a little more flexible morning schedule during the summer. I like mid-day bike rides with my friends. Oh yes! I love ALLLLL of those things! I miss riding bikes. My daddy and I used to when I lived at home, but my hubby doesn't really ride bikes. He had a semi-traumatic experience as a kid. haha. Absolutely love summer time!! I'm from a small coastal town in Maine, where the beach is a couple minute walk. The beach definitely has a special place in my heart as well. Now you've got me wanting an ice cream!! Ooooo! I would love to visit Maine! It looks so pretty! Girl speaking right to my heart on all of these things! I'm a sucker for the beach, ice cream, water activities (I love wake boarding at the lake!) and all things summer! I really want to try wakeboarding one day (and tubing)! I totally agree ice cream for days!! There's an ice cream shop around the corner from my house and I only allow myself a treat once a week!! And beaches ohhh beaches are a dream!